Archimandrite Ireini (Steenberg) – was born in the United States in 1978 . He was head of Theology & Tutor for Graduates, University of Oxford. In 2011 he became Founder and Dean of the Sts Cyril & Athanasius Institute for Orthodox Studies, San Francisco. “… being general in a Christian way—[mysticism is] encountering Christ but in a way that we can’t understand or can’t articulate.” ~ Hieromonk Ireini (Steenberg) from a lecture on “Orthodoxy and Mysticism”, 2010. 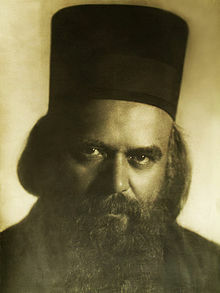 Saint Nikolai Velimirovich (1881-1956) – was a bishop in the Serbian Orthodox Church, an influential theological writer and a highly gifted orator.